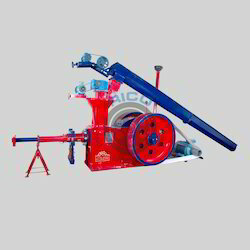 The Rice Husk Briquette Machine is used to make briquettes and we use ram type technology which is of low investment cost and give more output. The Supreme quality raw material is used in the manufacturing of briquettes to assure high performance. 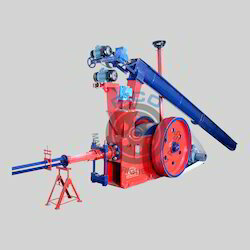 As the demand for rice husk briquette machine is increasing nowadays because of the scarcity of fuel. We are the best manufacturer, exporter and supplier of Rice Husk Briquette Processing Machine. All the divested raw material is collected and compressed under high pressure without using ash so it is an ecological process to make briquettes. Radhe Group Rajkot is one of the best manufacturer and supplier of briquetting machine. To make briquettes rice husk, coconut shell and jute waste are the best raw materials. Briquetting machine through we can make briquettes which are best substitute of coal and lignite. With the help of our modern technology, Radhe Industrial Corporation have set a benchmark as a well-known manufacturer, supplier and exporter of Rice Husk Briquetting Machine. Rice husk is the best raw material to make briquettes easily. We are manufacturing optimum quality rice husk briquetting machine within estimated period. Radhe Group Rajkot is the one of the leading manufacturer and exporter of Rice husk briquette making machine. We have vast experience in this manufacturing field. These machine can produce high energy concentrated rice husk briquettes which are used in various industries and available at reasonable cost in the market. Radhe Group Rajkot is wherever customers look for quality and cost-efficient Briquetting machines ends. We are committed to supply a premium quality Briquetting machine. Our models are extremely capable and useful to grind any type of raw material like coconut shell, rice husk and other agricultural waste. Every year million tons of agricultural waste is discharged. So, Radhe Industrial Corporation provides the answer to use this wastage within the best from. These wastage will simply be recycled into high density fuel (briquettes) with the assistance of rice husk Briquetting Plant. In Asian country and alternative agricultural primarily based countries, there's giant scope of this project because of immense accessibility of Biomass. Rice husk is a economical substitute to make biomass briquettes. Rice husk is silky material so to make briquettes we have to add another raw material. If it's not cheaper it will not sell. After mixing all this raw material we can directly feed it into briquetting machine to make briquettes. RICO is in the business of manufacturing briquetting machine. These advanced and innovative machine produce biofuel which can replace the use of traditional source of energy like petrol, gas and coal. And to make briquettes there is no need to any binder so it is ecofriendly technology to make briquettes.